Many years ago – more than a decade ago – I was involved in a visit to a Mediterranean country by an ecumenical group of Church leaders from the islands, including a number of bishops. 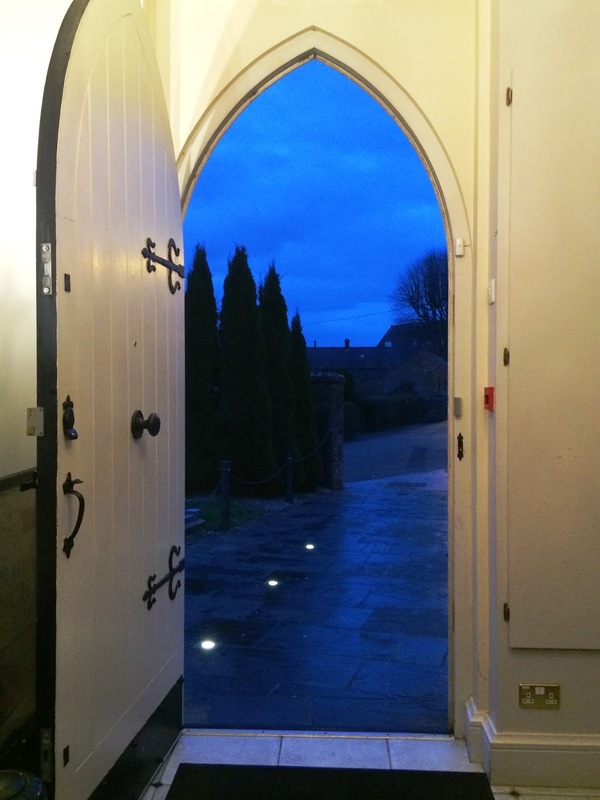 Everywhere we went there was a warm welcome, from ambassadors and abbots, in monasteries and cathedrals, in small churches and at lavish dinners. There were formal occasions when ecumenical guests and government ministers from the country we were visiting were present. At all times, the Irish and British co-operation was friendly and fruitful. The highlight of our visit ought to have been a formal reception hosted by the Patriarch of the main Eastern Church in the country where we were guests. We had met him earlier during the visit, but only briefly, but this was a very formal occasion. To one side I could see a large tray, resplendent with an array of glittering icons. I realised that these were presents prepared for the visitors. There were formal introductions, and then the Patriarch began to speak about the conditions of the Church in his own country, the sufferings it had endured in the past, and the struggle that Christians had engaged in to keep their faith alive. It is a challenge I am sure Christians have faced in virtually every country I have visited in the Eastern Mediterranean, and it has shaped and formed their narrative throughout the region. But as he continued with his recollections, the Patriarch turned to his own analysis of the churches on these islands. In his opinion, we had little understanding of suffering, we had failed to struggle to keep our churches open, and instead of engaging in mission, we had sold off our church buildings. He chided us. If only we had known the cost Christians in his country had paid to keep their churches open, we would not have been so hasty in selling or leasing our churches and allowing them to be used as car workshops, bars and restaurants. As I spoke, I saw his eyes beckon one of his priests. Silently and unobtrusively, without other members of our party noticing, the tray was removed, and replaced with a smaller tray, with smaller trays. In the course of the Patriarch’s address, he had decided our delegation was of less importance than he originally believed. We were demoted, although no-one else knew it. 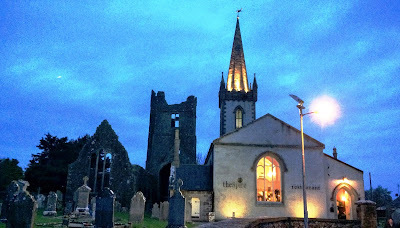 This evening, four of us went for dinner in the Spire restaurant in Duleek, Co Meath. 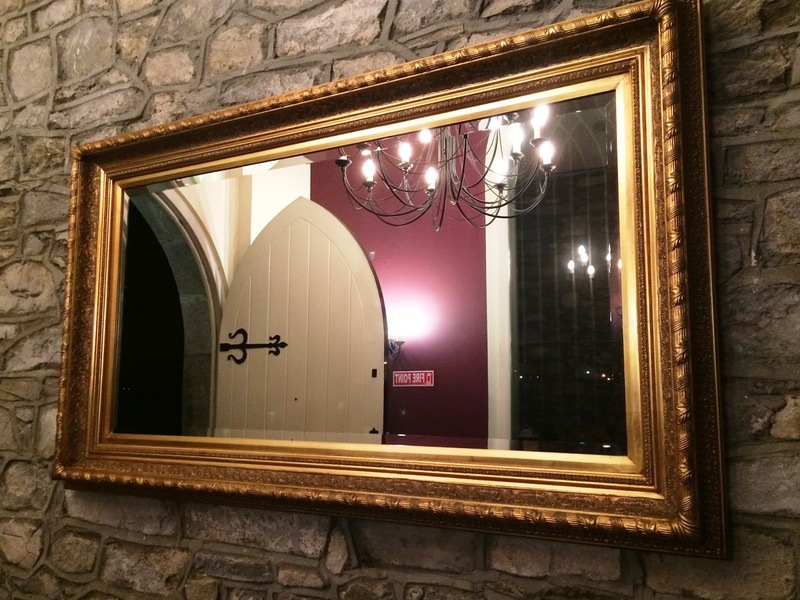 The restaurant is housed in a former Church of Ireland parish church beside the ruins of Duleek Abbey. The premises were in a sad state of neglect for a number of years until Aogán and Karen Dunne re-opened the Spire on 14 August 2013. The Spire Restaurant is located in the former Saint Cianan’s Church. The atmosphere reflects its ancient locale, illuminated by nature, and enhanced by the beautifully stonemason-crafted and flood-lit spire. The interior of the restaurant has been transformed into a splendid restaurant, and the food, fare and attention made this an enjoyable evening. I am not questioning whether Duleek might not continue to benefit from a Church of Ireland presence, and perhaps a new expression of this may be found in the future. But in the meantime, despite the words of an upset and now departed Patriarch, it is better to see an old, disused church serving the community as a good restaurant than to see it fall into decay and ruin. 11 a.m.: The Sung Eucharist. Christmas is truly over for most people … and many of those New Year’s resolutions are truly forgotten too: who wants to be reminded this morning about exercising more, eating less, rising early, clearing out the spare room? Most of these good intentions went out the window when we went back to work, when the children went back to school, when the decorations and the trees came down. But, the truth is, Christmas is not over. There’s more than another two weeks to go. Christmas is a season of 40 days that ends with Candlemas on 2 February, the feastday that links Christmas and Easter, that links the cradle and the cross, that links the Incarnation and the Resurrection. The feast of the Epiphany did not end on 6 January, but continues throughout these weeks. And so, this morning is the Second Sunday after the Epiphany. Epiphany celebrates not one but three great Epiphany or Theophany events, reminding us what Christmas is truly about and who the Christ Child is for us. 1, We celebrated the Visit of the Magi almost two weeks ago [6 January 2016]. 2, Last Sunday [10 January 2016], we read about the Baptism of Christ in the Jordan. 3, Then this morning [17 January 2016], we have the Wedding at Cana, which is an Epiphany or Theophany event too when, even before his time has come, Christ shows who he is. Sometimes, this morning’s Gospel story is so familiar that we forget what its first impact may have been like. The saying about serving the good wine first is so well known that we forget that this is not what happens at all. 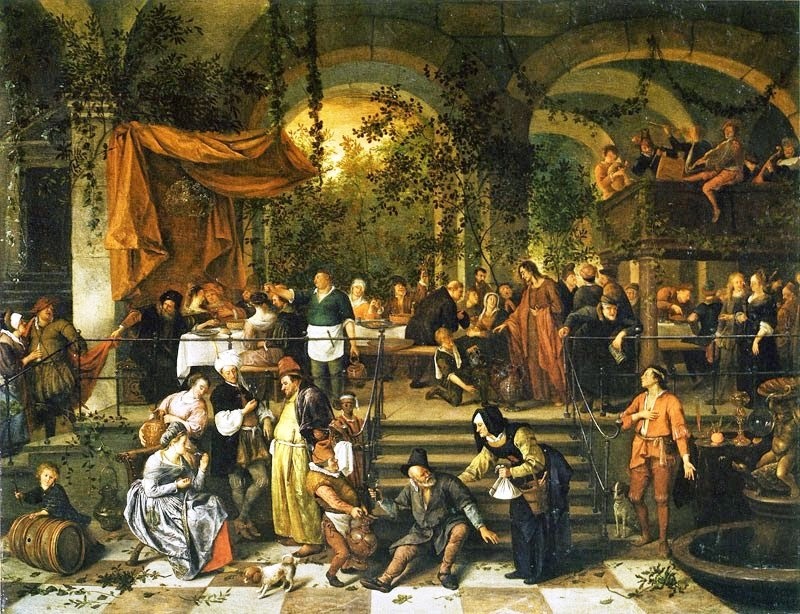 Sometimes, we convince ourselves that at this wedding in Cana they plan to first serve the good wine, and then when people are drunk they can put up with cheap plonk. Think of how many festive meals finish with the good wine. 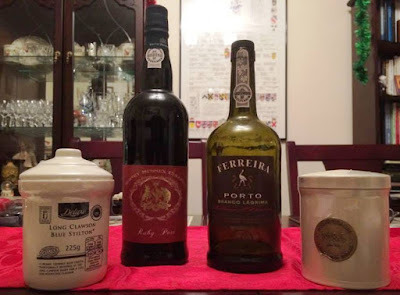 We were surprised rummaging around after Christmas to find two bottles of fine port we had forgotten about: one from Portugal and one from the cellars of Sidney Sussex College, Cambridge; and beside them, a good bottle of desert wine that we have received as a present in Greece. They were such appropriate ways to finish off some good meals and celebrations at Christmas and the New Year. No good wedding would finish without opening the champagne to toast the happy couple. In Greece, and in other parts of the Mediterranean, where wedding celebrations can last for a few days, perhaps three days, the good wine comes out at the end, to toast the couple and to send the guests away knowing they have been welcome. And this wedding story is about one other, long, weekend wedding, like so many that Jesus and the Disciples would have enjoyed. 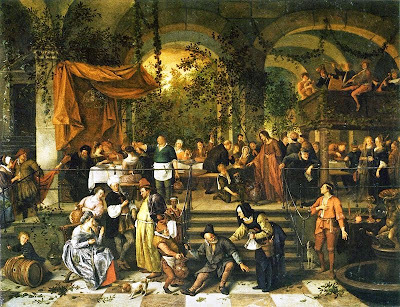 Because he enjoyed a good wedding, Jesus uses the wedding banquet as an image of the Kingdom in two other Gospels (see Matthew 22: 1-14; Luke 14: 15-24), and it helps to understand why he is referred to as the bridegroom at least 14 time in the New Testament (e.g., see Matthew 9: 14-15; Matthew 25: 1-13; Mark 2: 18-20; Luke 5: 33-35; John 3: 29; Revelation 18: 23; Revelation 19: 9; Revelation 21: 2). And so, as with a wedding story, we might expect this morning’s Gospel story to be one about love, and one in which they all live happily ever after. Imagine or picture in your mind’s eye the happy couple who turn up for this wedding. This should be their great day. People have come from far and wide to be with them, to celebrate with them. And in good Mediterranean fashion, after two or three days, when everyone is about to go, there is a last dance, and a last toast: to the Bride and Groom. Or, so it was planned. But before they get to that stage, the wine gives out (verse 3). Wine fraud is one of the oldest frauds in the world. Perhaps the finger of suspicion points at the chief steward, the master of the feast, the ἀρχιτρίκλινος (architríklinos) in verses 8-10. He’s certainly not a model of probity as a wedding planner. And I fear he is avoiding some potentially tough questions when he claims dismissively: “Everyone serves the good wine first” (verse 10). So often in life, ordinary people are cheated out of what is theirs, deprived of what they should be entitled, left without hope. That’s the way of the world, that’s the experience of ordinary people in this world. The “Queen of Mean,” the late Leona Helmsley (1920-2007), once said when she was on trial for tax evasion: “Only the little people pay taxes” (1989). So often in life, it’s the people she dismissed as “the little people” who pay their taxes, and pay the price when it comes to cuts in public services, the collapse of banks, or bear the brunt when it comes to floods and natural disasters. There are no heads of state or CEOs from large multinationals among the Syrian refugees seeking asylum in Europe today. As a former journalist, I often came across stories of workers looking forward to retirement only to find they are made redundant or the hoped-for pension pot has been siphoned off. Imagine the embarrassment of the couple cheated out of the toast to the bride and the groom at the very end of their wedding celebrations. But Christ is with us at the moments when we feel cheated of our hopes for the future. It’s over 50 years since Frank Sinatra had a hit with the song. “The best is yet to come” and these are the words on his gravestone. We make family at weddings, but we cannot control family. Already, I have invitations to three family weddings later this year. But I have no say over who my brothers-in-law are, who my nieces or nephews marry, and I certainly have no say about who my grandparents were, the decisions they made or the way they behaved. And that is so for the generations to come too. I imagine the Kingdom of God is like that. Those who are invited to the heavenly banquet are going to include people I at first may be uncomfortable to sit with at the same table. But I am not the host, I am the guest, and the invitations are sent out into the side-streets and the alleyways (Matthew 22: 9-10). “Blessed are those who are invited to the marriage supper of the Lamb” (Revelation 19: 9). In the Kingdom of God, the best is yet to come. 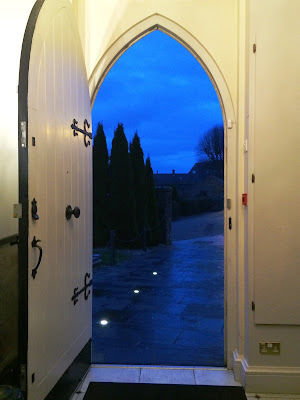 This sermon was preached at the Sung Eucharist in Christ Church Cathedral, Dublin, on Sunday 17 January 2016. 1 Καὶ τῇ ἡμέρᾳ τῇ τρίτῃ γάμος ἐγένετο ἐν Κανὰ τῆς Γαλιλαίας, καὶ ἦν ἡ μήτηρ τοῦ Ἰησοῦ ἐκεῖ: 2 ἐκλήθη δὲ καὶ ὁ Ἰησοῦς καὶ οἱ μαθηταὶ αὐτοῦ εἰς τὸν γάμον. 3 καὶ ὑστερήσαντος οἴνου λέγει ἡ μήτηρ τοῦ Ἰησοῦ πρὸς αὐτόν, Οἶνον οὐκ ἔχουσιν. 4 [καὶ] λέγει αὐτῇ ὁ Ἰησοῦς, Τί ἐμοὶ καὶ σοί, γύναι; οὔπω ἥκει ἡ ὥρα μου. 5 λέγει ἡ μήτηρ αὐτοῦ τοῖς διακόνοις, Ο τι ἂν λέγῃ ὑμῖν ποιήσατε. 6 ἦσαν δὲ ἐκεῖ λίθιναι ὑδρίαι ἓξ κατὰ τὸν καθαρισμὸν τῶν Ἰουδαίων κείμεναι, χωροῦσαι ἀνὰ μετρητὰς δύο ἢ τρεῖς. 7 λέγει αὐτοῖς ὁ Ἰησοῦς, Γεμίσατε τὰς ὑδρίας ὕδατος. καὶ ἐγέμισαν αὐτὰς ἕως ἄνω. 8 καὶ λέγει αὐτοῖς, Ἀντλήσατε νῦν καὶ φέρετε τῷ ἀρχιτρικλίνῳ: οἱ δὲ ἤνεγκαν. 9 ὡς δὲ ἐγεύσατο ὁ ἀρχιτρίκλινος τὸ ὕδωρ οἶνον γεγενημένον, καὶ οὐκ ᾔδει πόθεν ἐστίν, οἱ δὲ διάκονοι ᾔδεισαν οἱ ἠντληκότες τὸ ὕδωρ, φωνεῖ τὸν νυμφίον ὁ ἀρχιτρίκλινος 10 καὶ λέγει αὐτῷ, Πᾶς ἄνθρωπος πρῶτον τὸν καλὸν οἶνον τίθησιν, καὶ ὅταν μεθυσθῶσιν τὸν ἐλάσσω: σὺ τετήρηκας τὸν καλὸν οἶνον ἕως ἄρτι. 11 Ταύτην ἐποίησεν ἀρχὴν τῶν σημείων ὁ Ἰησοῦς ἐν Κανὰ τῆς Γαλιλαίας καὶ ἐφανέρωσεν τὴν δόξαν αὐτοῦ, καὶ ἐπίστευσαν εἰς αὐτὸν οἱ μαθηταὶ αὐτοῦ. For one moment, I was tempted to think I am in the middle of nowhere, and I found myself humming Stuck In The Middle, written by Gerry Rafferty and Joe Egan and recorded by their band Stealers Wheel in 1972. For most of his life, he had been caught in the middle of nowhere, like that short stretch of road in Bunclody, neither in one place nor the other. But that’s a story for the Diocesan Magazine … to come.